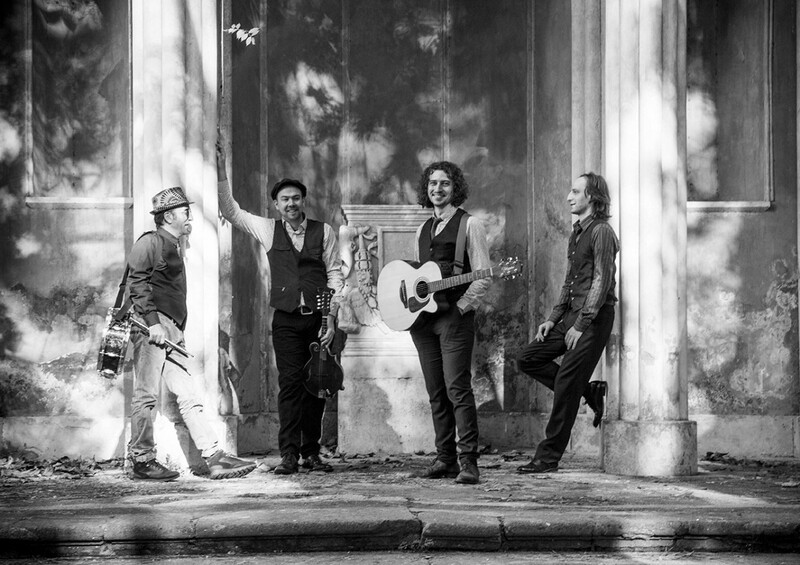 The Waistcoats are an Irish and Italian wedding band Italy who deliver a passionate and energetic performance that will get everyone singing and dancing, young and old alike! 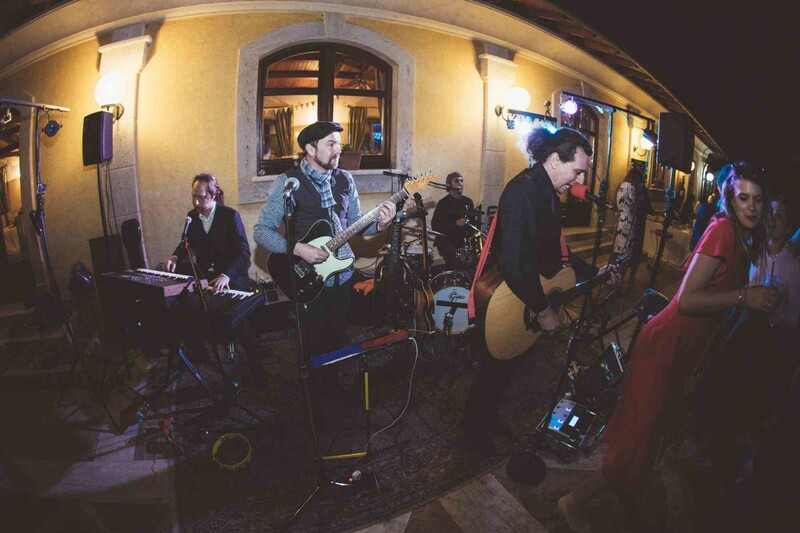 The band is made up of Irish and Italian international musicians who have been performing at weddings for years! Not only are they perfect for your wedding, they’re also great for all your pre- and post-wedding parties. 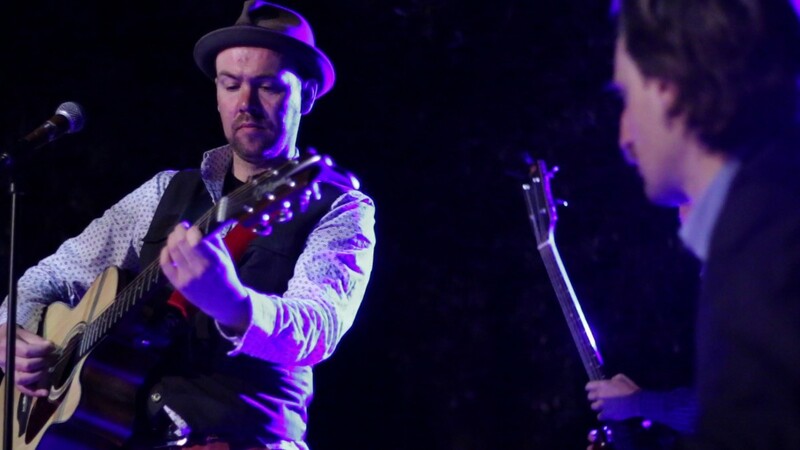 Paul Staunton (guitar/mandolin/vocals) is a Dublin native who comes from a family with a rich musical background. He also lived and played in New York for many years, while Sal (vocals/guitar) is a German-born Italian showman who can be heard occasionally in voice over projects on German TV. Sal and Paul have been performing together for more than 9 years and will go the extra mile for you! Don't need the entire band, but prefer a duo instead? Sal and Paul are happy to oblige! 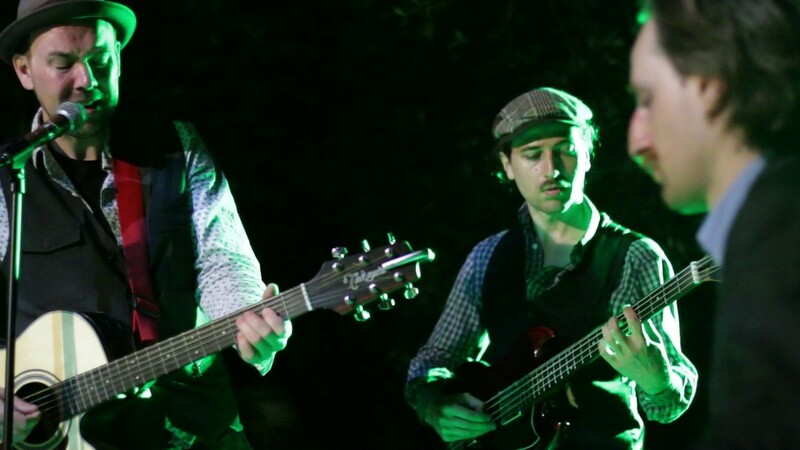 The Waistcoats can also do acoustic sets as a duo, trio or with the full band to accompany your aperitifs before the wedding, or a pizza party the day after. Just contact us and we will create a custom package to suit your specific needs. 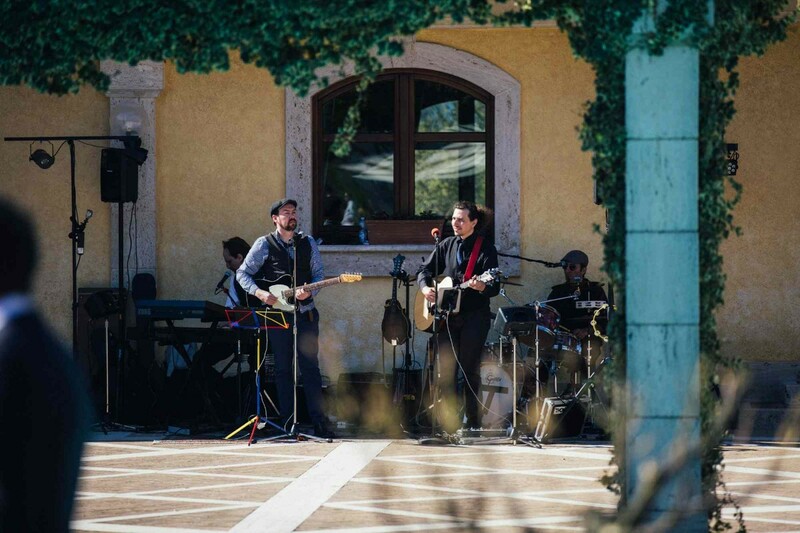 From an Irish wedding band in Italy to an Italian wedding band experience, we have you covered. We perform all over Italy, from Lombardy over central Italy (e.g. Borgo di Tragliata) to Sicily! Upbeat, friendly, energetic, and professional...we love to entertain you on your big day! Good communication before the event, nothing to say about that. On the day, we let the band be judge of what music would be best by "feeling the mood" but still provided a few titles we liked in case. Their choices of music were just great. Young people liked it, old people were singing along for some song so what else to ask. The band was overall outstanding and we had a lot of feedback from our guests about that so they totally nailed it. We got married in Roma and had our reception at Hotel Quirinale. The Waistcoats were simply amazing. 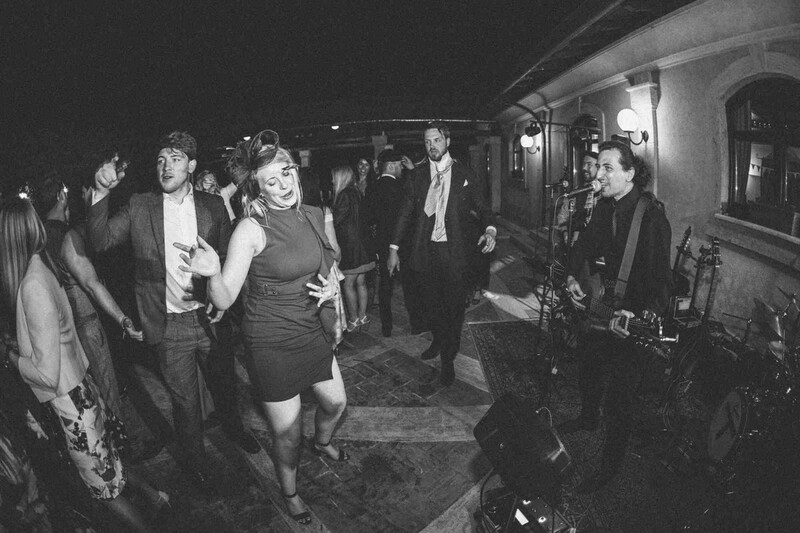 We had about 60 at our wedding so i was on the lookout for a good band that would keep the crowd on the floor. When i contacted the band, Paul was an absolute gentleman and was so kind and helpful. From the moment they began playing i was at ease, the crowd loved them and they pleased everyone as we had a varied age group! My parents never dance at weddings but they didn't leave the floor and that was down to Paul and his bandmates. We had an absolute magical day and danced the night away. I have received so many compliments about the band! So if you arw planning an Italian wedding look no further! Thank you Paul and co! The Waistcoats were simply amazing for our wedding! We couldn't have asked for anything better. From the first time we contacted Paul, the professionalism, responsiveness and support they provided was second to none. They were also very accommodating to our ever changing plans leading up to the wedding. The Waistcoats were the perfect fit for our wedding given that we are an Irish/Italian couple. All of the guests thoroughly enjoyed their set and our guests keep talking about how great they were. They played the whole time without any break, kept the crowd dancing and party going. If you are thinking of booking The Waistcoats, just do it! You won't regret it! Amazing band. The Waistcoats really helped make the day perfect. The selection of music was spot on and when they finished they left a crowd of people chanting 'one more song'. Everyone at the event wanted more and people said that they were the best wedding band they'd seen. Even before the event Paul was extremely helpful and responses. I'd recommend the Waistcoats to anyone for any event. Thank you guys! 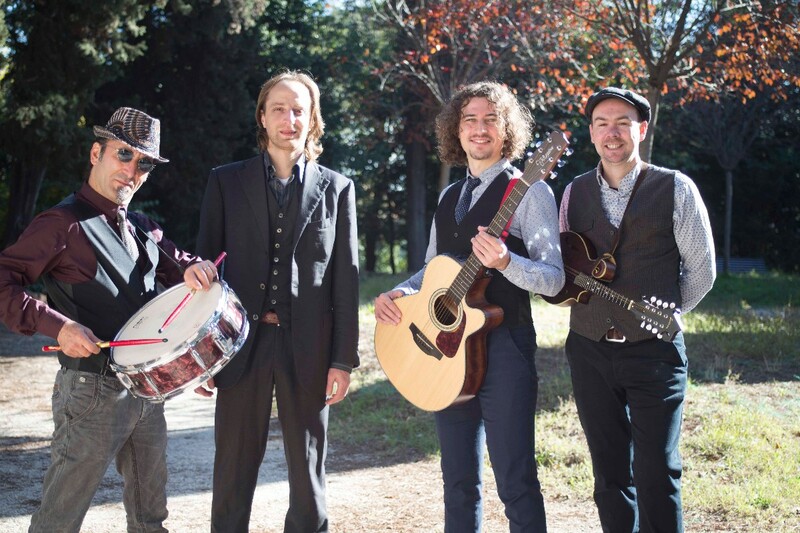 I was looking for an Irish band in Italy and found the waistcoats online. To be honest, I was so glad to find the band that covered both Italian and Irish that I wasn't too concerned about the quality. But wow, the professionalism was off the charts. We didn't have a wedding planner and Paul had so many tips and contacts. And then for the big day... I hit the jackpot. Not only were they super to work with and ticked all my boxes but they were an incredibly talented bunch of musicians!! Thank you big time. Couldn't recommend them enough! What can I say about such a fantastic team? The waistcoats absolutely made the day! From Paul’s patients, coordination and organization leading up to the day. Francesco’s amazing talent playing at the church. The perfect choice of songs during cocktail hour. The impeccable accommodation for the many, many requests we made , and getting the party started during the reception. We feel so blessed to have found you guys and to have had you a part of our special day! We can’t tell you how many of our guests have said what a fantastic band we had. How you all managed to travel to the remote town of Cortale, Italy and managed to fit in every song and request with very little assistance. You completely took the stress off of us and just did a fantastic job! We really can’t thank you all enough! Paul was absolutely brilliant from the moment we contacted him! He helped us with the SIAE licence as well as suggesting a make up artist for us! 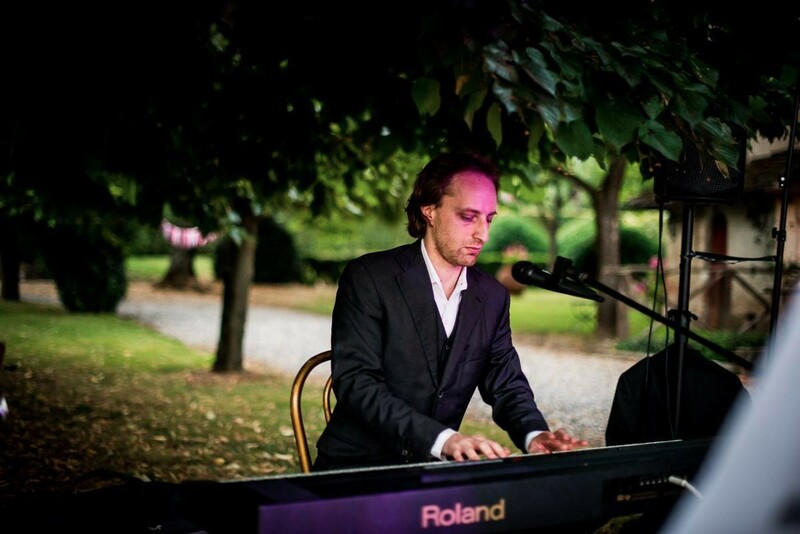 The guys were brilliant on the day of the wedding, doing classical piano for the ceremony, acoustic duo for the aperitif and full band for the evening reception! The guys kept everyone on the dance floor and I cannot recommend them highly enough! Great band, great guys and great service!! Booking the band was one of the things that I was most worried about as it is usually recommended that you listen to the band before you book. I found the Waistcoats online and from the moment I emailed with a query Paul was amazing. He was so quick at getting back to me and provisionally booked us in while we confirmed other details. Paul and Sal were so helpful in organising the SIAE licence for the wedding and leased with hotel to sort out practical details for us. This was a massive help to us and reduced stress in the run up to the wedding. On the day the band were amazing from start to finish. I had classical piano music for the ceremony and this was very romantic and suited the setting. The band played the aperitif at the hotel while we were getting photographs and went down a hit with all guests. After the meal the band then played for a few hours, unfortunately we were restricted to 12:30am finish due to laws in Rome for music on an outside terrace. The playlist options had songs to suit all tastes and the band even learnt a few songs for us. The guests were blown away by the band and kept asking where I had found them. They nicknamed Sal, the Italian Hosier. I would recommend The waistcoats to anyone planning a wedding abroad as they really helped make our day amazing. The support they gave us in months and weeks before wedding was really appreciated and meant we could relax and focus on other things. We would like to say a massive Thank- you to Paul, Sal and the rest of the band. Amazing! Paul and his band the Waistcoats provided an incredible service from the moment I first enquired about their availability to the day the played at our wedding. Paul was always quick to respond to emails and was open to suggestions in regards to what, how and when to play. They also were flexible enough to step in on short notice and play a beautiful acoustic set for the ceremony when my cousin could not attend. They were brilliant on the day. They arrived bang on time and were open to compromise regarding the use of a marquee on the day. Paul was very open to our song suggestions and learnt a few of our favourites for the day. The set list on the wedding day was on point for our guests. I received lots of positive feedback regarding the aperitivo set and witnessed the enjoyment had by all during the main set. Everything Paul and the Waistcoats did in the lead up to and on the day contributed to us having our perfect wedding! The Waistcoats were part of our wedding day from the ceremony right through to the end of the night. We had piano for aperitif and ceremony, acoustic trio for appetizer buffet and the full band played after the dinner until the end of the night. The guys were absolutely brilliant and created an amazing atmosphere throughout the day. Our guests loved the variety of music which meant the dance floor was packed all night. 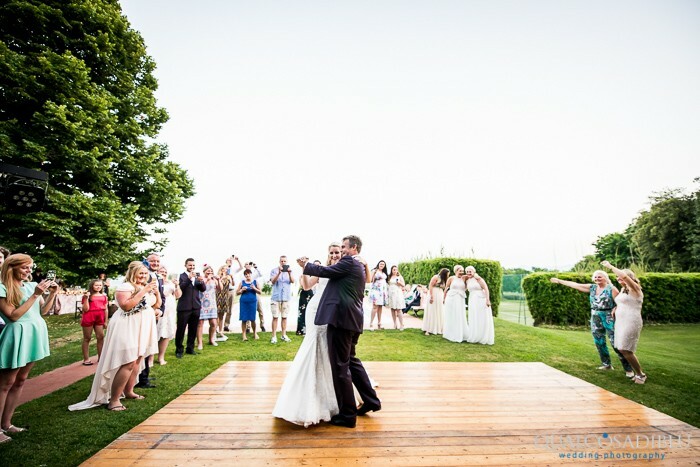 They were very professional, flexible and made everything easy to organise from abroad. We highly recommend The Waistcoats and we cant thank the guys enough for all the help leading up to the day and on the day itself. 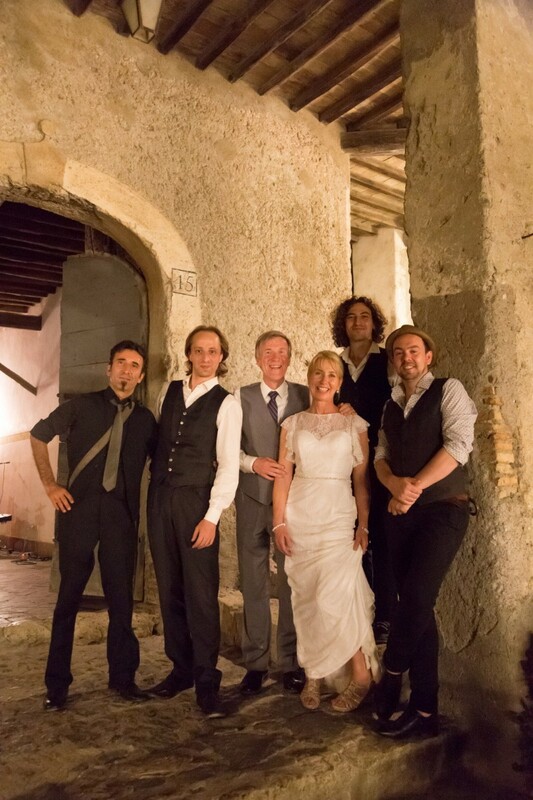 The Waistcoats played at our wedding in Tuscany on 7th July and we couldn’t have been happier! Paul was super responsive in the planning and they even learnt a favourite song of mine. Francesco played classical music before/during the ceremony and then they played a fantastic acoustic set over aperitifs. The band let us use their microphones & set up for speeches and they provided a great playlist during dinner. The main event was the live set in the evening where the boys did a stellar job of getting everyone up & dancing, even pulling “Summer of ‘69” out of the bag when they had a special request from one of our guests, apparently it was the first time they’d played it but they delivered it like true professionals. Finally, they delivered a DJ set at the end of the night using a playlist that I’d put together beforehand. The Waistcoats helped to make our day so amazing, I would highly recommend them for any wedding or special occasion. 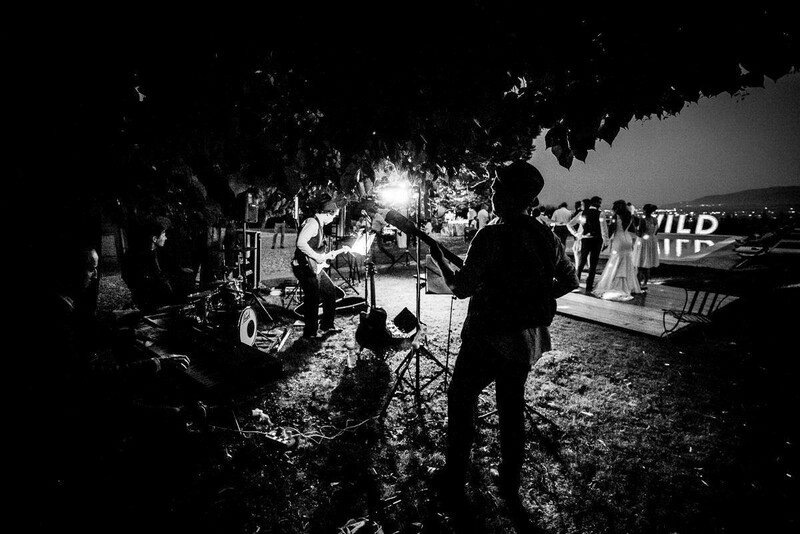 The Waistcoats played at our wedding in Abruzzo on 6 July 2018 and they were fantastic. The music was brilliant but just as important was their professionalism and flexibility. Over the course of the day we had beautiful classical music during the church ceremony, some cool acoustic tunes during the aperitivo, a fantastic ad-hoc guitar and voices session during the cutting of the cake then an amazing after dinner dance session! The guys were great all day, they were very calm and didn't need us for anything. They were happy to help with anything, and blended in well all day- absolutely faultless and couldn't recommend them highly enough! Dealing with Paul & co. via e-mail in planning so very straightforward, and there was nothing they wouldn't do for us! They even learnt our first dance request, and added in a few songs which weren't within the playlist! All the above has handled via e-mail between The Waistcoats and myself in London, and it was super easy to manage. 10/10! Words cannot describe how fantastic the waistcoats were at our wedding, both in the church and at the reception, nothing was a problem and the guests were delighted with the guys, we would highly recommend booking the waistcoats. Paul is Irish like ourselves and it made having an Italian wedding flawless as sometimes the language barrier can cause confusion!! , we would be happy to give a personal recommendation to anyone thinking of booking the waistcoats for their special day in Italy . Thank you again and keep up the great work!! Billy and Grace. The Waistcoats were our wedding band for our Italian wedding (Swiss couple). We hired them for live music as well as DJ in the evening at the wedding location. Unfortunately our organist failed to perform all agreed songs on very short notice. But The Waistcoats were super flexible and managed to come to the church as well and performed those songs, thank you guys so much! The guys are very professional, flexible and extremely friendly! 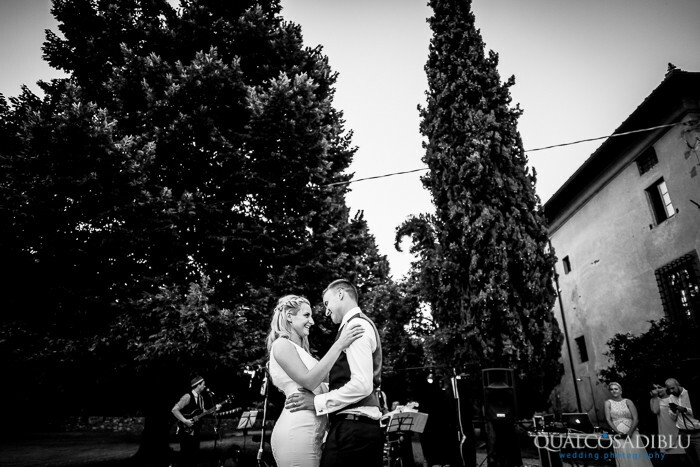 The process for selection of songs was easy and straightforward as was the whole interaction and communcation with them which helped us a lot during the busy time of wedding preparation (especially for organizing a wedding in Italy from Switzerland). Not to mention that they are great musicians, they really felt the pulse of the audience and created an incredible party atmosphere. Thank you guys so much for making our wedding even more memorable! Hi Stefan, we were happy to fill in for your organist, I'm glad you enjoyed our service and performance! It was a pleasure for us to play at your wedding, we wish you all the best for the future! Excellent show and Sal is pure gentleman too. Sal, Paul and the gang were absolutely fantastic in every possible way. SO helpful, particularly as we are British and we had to arrange all of the music permits which are on Italian websites - The Waistcoats have thought of everything to make your lives as easy as possible! And on the day, they were extremely friendly, enthusiastic and flexible due to changing timescales etc. Such an amazing bunch of guys and of course the music was fab too! Thank you so much guys - we wouldn't hesitate to recommend you to anyone! We were so lucky to have found the Waistcoats. They were exactly what we were looking for. Upbeat energy with a wide range of songs. They worked with us through the entire planning process with excellent communication. Any requests we had, they were able accommodate. They even learned a few new songs that we wanted to hear at the wedding. They really helped make our day very special. They played beautiful acoustic music for our ceremony, nice lively background music for our cocktail hour, and then kicked it up with a great upbeat playlist for the reception. I'd highly recommend them to anyone planning a wedding in Italy. The Waistcoats were wonderful to work with. Very supportive especially as we were organising our wedding from Asia. Really understood what we wanted and our guests loved the band. We spent the whole night dancing. Paul was always quick to respond and catered for our every request.’would not hesitate to recommend them! The Waistcoats were the perfect band for our wedding. 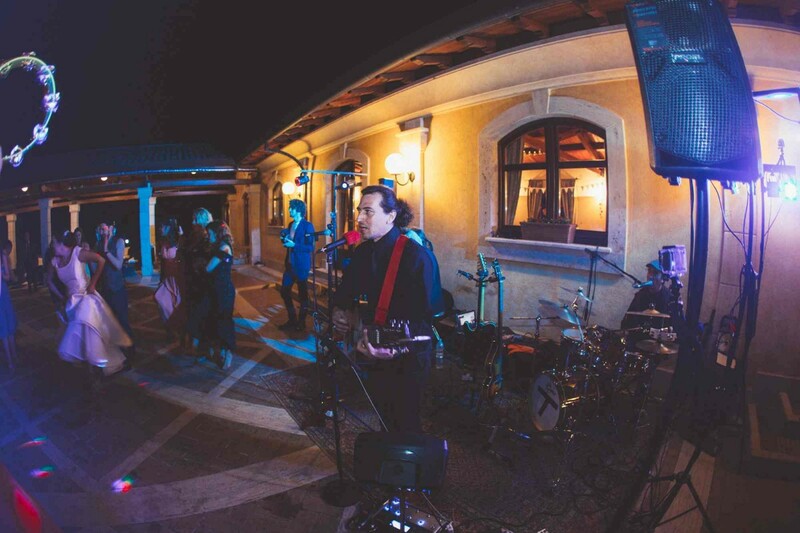 They have an extensive and eclectic repertoire and during the event they went above and beyond to ensure everybody had a good time. Responsive to our requests, needs, and style. Highly recommended! I couldn't recommend The Waistcoats more! They were more than helpful and my guests absolutely loved them. We had a full dancefloor all night. The waistcoats were the perfect band for our Italian wedding. Paul made it easy and relaxed to organise what we wanted on the day and made some great suggestions on the day itself. The music they played was perfect for each moment of the day and all our guests were up dancing for most of the evening - they even let a few get involved and sing! From being slightly nervous about finding a band in Italy - The waistcoats allayed all this after there first song during the afternoon. I fully recommend them for an Italian wedding! We couldn't recommend the Waistcoats enough! We had quite a small wedding in the centre of Rome but still wanted music and dancing for the evening. Searching and booking this from abroad was quite daunting but as soon as I emailed Paul he was quick and professional in his responses and so went with a trio for after our meal. We found this option extremely reasonable and considering the size of our wedding it was the perfect option. There were plenty of song choices to choose from which we did but we also let Paul & the boys work away with what they felt our guests liked which meant they were up dancing all night which again considering the small number of guests we were a bit apprehensive about. Lots of our guests commented on how great the band were and wondered how we managed to to sort such a good band from abroad! Paul and the boys learnt a new song for our first dance which was perfect and this was not a bother to them at all. When it came to sorting the SIAE permit, both Paul & Sal were extremely helpful when I came across an issue and couldn't do more to help and check it was all done correctly. The whole process of booking & contacting the band was so straight forward which was one less thing for us to worry about when booking our wedding from abroad. And of course the actual music on the day was much better than we were expecting/hoping for so thank you! Sal and Paul from the Waistcoats were lovely to work with. No issues from moment of first contact. Definitely did not need to have any worries. They were very accommodating of our guests who wanted to get up and get involved in a sing song also. We booked the waistcoats to play at our wedding reception in Rome. From the beginning, Paul was very helpful and very quick to respond to all our comments and queries. They have a huge song list ranging from traditional Irish songs to contemporary pop/rock/country music. Both our families thoroughly enjoyed the music and we had such a good craic. Both Paul and Sal have fantastic vocals and Francesco was amazing on the Keyboard. My dad is a keyboardist and he used to play at gigs and events in India before moving to Ireland, he was full of praises of the band. He is a hard man to impress! I would recommend the waistcoats to any couples looking to get married in Italy. Ours was a small wedding with only 14 guests and having the band was a great way to lift up the evening. Thanks a mil guys! Salvatore was an excellent musucian. He interacted very well with the guests . Immediately after contacting Salvatore he responded and was keen to find out what type of music we needed. We really didnt know what to expect but he interpreted the guests style and all had a great night I would recommend him without any hesitation. We booked Sal & Paul for our wedding in Borgo Di Tragliata, Rome, Italy for our wedding this October & wow they are amazing!!! If anyone is looking for a full band, church music, one man band etc these are the guys to contact! They were so much fun & kept us dancing all night, guests are still raving about them!! Highly highly recommend!! While trawling the Internet from Ireland to find a band to play at our wedding in France I came across The Waistcoats and I can honestly say, it was one of the luckiest finds that I had. From the very start Paul was extremely helpful and professional in all my dealings with him and was available at all times to help with any questions I had regarding the Band playing at our wedding. I have always judged a band at any function I have been at, on the amount of people dancing and the interaction between the band and the guests. I can honestly say that from the very first song played everyone was up dancing and the dance floor was full all times (including my 80 year old mother who hardly sat at any stage while they played). When the Band finished the guests were left longing for more and the feedback from all guests was it was one of the best wedding bands they had ever heard. Pat & I would like to thank all the Guys from The Waistcoats for helping to make our Wedding Party as special as it was. Any Bride and Groom or indeed any function would be lucky to have them playing at their event. Sal and Paul played on the third night of our wedding during a pizza party. By that time, everyone was a little tired and emotional so the energy levels weren't superb. Sal and Paul were fantastic in how they adapted their set to the prevailing mood. They slowly ramped it up to full on party mode and had plenty of interaction with our guests. By the end of the night, everyone was up and dancing. The variety in their repertoire is fantastic, from Irish to chart, as is the quality of their music. They're also super easy to deal with both in advance of the event and on the night itself. I absolutely recommend booking them to help add lots of great music and personality to your wedding! Paul & The WaistCoats from the very beginning where brilliant, we had a vision in mind which Paul helped us realise, his guidance was invaluable in the weeks running up to the wedding, every email answered quickly every idea explored without hesitation, we bounced ideas back and forth and this made the day of the wedding incredible, the guys carried out music for the ceremony, the aperitifs, the dancing and then a DJ set! We couldn't have asked for more, very professional and very good guys all round. I wouldn't hesitate to recommend the WaistCoats..5* service all the way. Kevin & Marian PS. Thanks so much Guys we had the best craic. 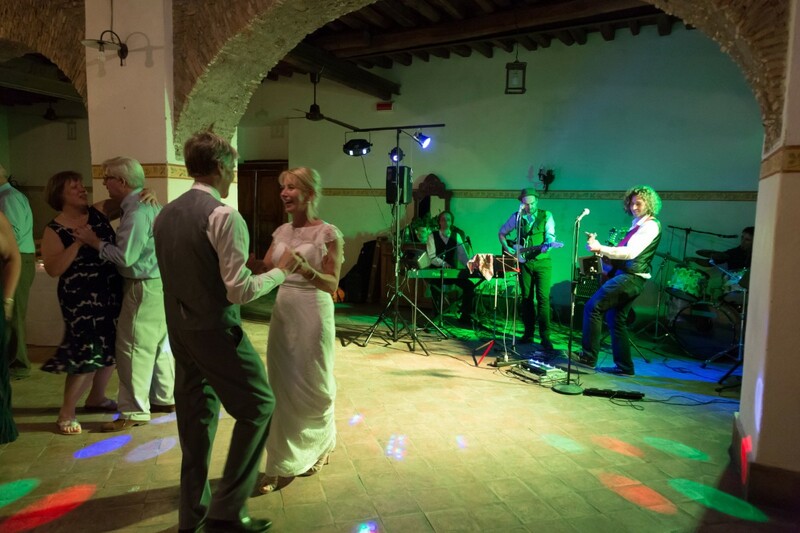 We recently got married in Italy as an Irish couple with 99% Irish guests, we cannot put into words how happy we were with the Waistcoats, they were flexible helping with music at the Aperitif and equipment in the church. 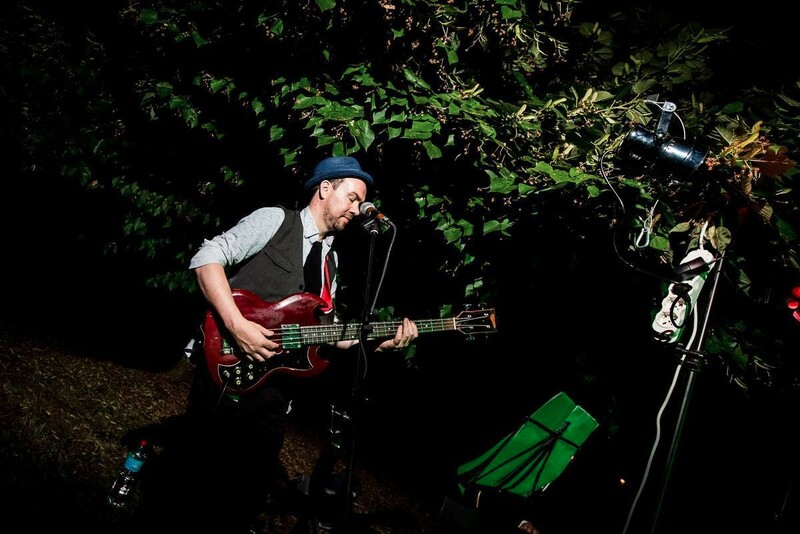 We had the band on the day of the wedding and we booked the acoustic set for the following day; our guests were blown away and we were so happy with their engagement with the crowd and quality of music. We could not recommend highly enough, they were an absolute pleasure to work with. 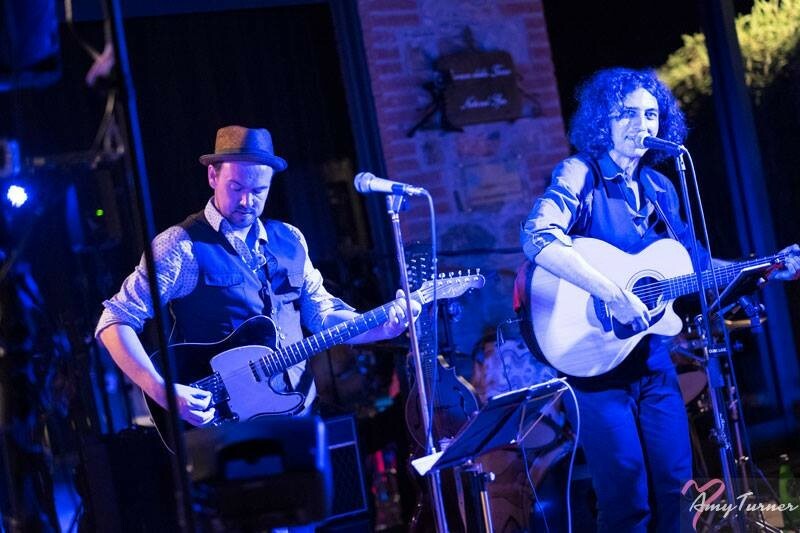 We had Salvatore to play at out post-wedding party in Borgo di Tragliata, Rome. Being the night after the wedding, we had a lot of tired and subdued guests but after Sal started playing, all tiredness was well and truly forgotten. Sal had all of our guests on their feet all night and people haven't stopped talking about how good he was ever since! He well and truly made the last night of our wedding unforgettable and I cannot recommend him enough for anyone looking for wedding entertainment, either for the wedding party or night after. The songlist provided by the Waistcoasts was phenomenal and provided for all tastes from Irish ballads (every one you could think of) to chart music and there really was something for everyone. We couldn't have asked for any more! An amazing band! Friendly, helpful and professional! Great music throughout the night that all my guests enjoyed and danced to... I definitely recommend the waistcoats to anyone looking for a fun band as they aren't just good but also extremely helpful with everything you need! 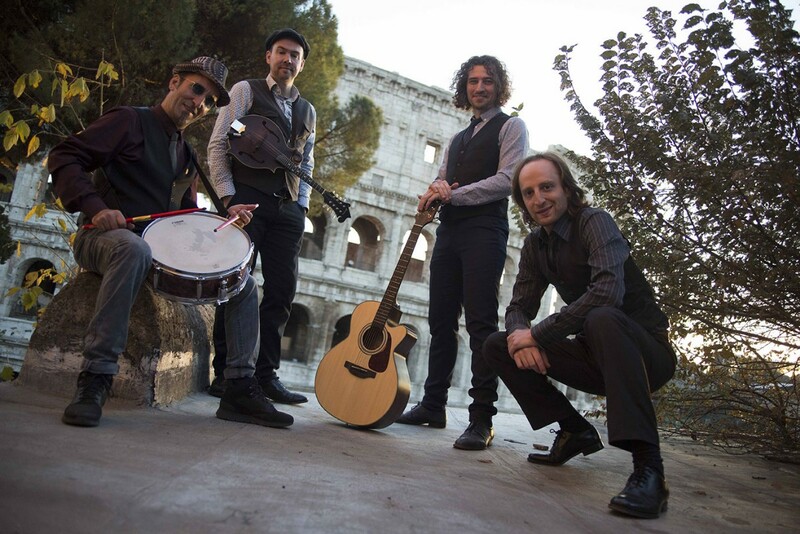 We had seen The Waistcoats play at a couple of events around Rome and were amazed with the range of music they would play. When we got in touch they were happy to talk to us and chat about the wedding, and they were very well-versed about music in and around Italy. We were particularly impressed with the band going above and beyond what we had originally agreed, meaning that they were the least stressful part of the entire day. They helped the whole group relax after the ceremony, as well as party on into the night. Couldn't recommend them highly enough. The Waistcoats literally made our Irish Hen Party weekend. They played for my sister's Hen Party at my country home in Rome, Italy. Everyone was up dancing the whole time, and couldn't stop talking about the band afterwards. The band was always quick to respond to messages and calls, such a nice group of guys, and very polite when we ran a bit late on the night. A talented group of guys with a huge repertoire also of lively classics and modern songs. I'd highly recommend them!! Sal was a complete gentleman from the day we contacted him to the night he played at our wedding. He is a wonderful singer and a real showman. We had his one man band the day after our wedding and he was brilliant. Highly recommended!! The band was absolutely fabulous!! As we live in Australia and had the wedding in Rome, Paul was kind enough to check the venue out for us in advance, which was a massive help! They had quite a library of music to choose from! To which all the guests agreed upon!! I could not recommend these guys highly enough!!!! Great bunch of Musicians!! We had our wedding last September at the Byblos arts hotel in Verona, Italy. The waistcoats really rocked our wedding. Our guest we're dancing and having fun all night long. They had a great energy. They were very accommodating with our song request and they were always there to respond to our questions along the way thru e-mail. Overall great ! Thank you Waistcoats ! Ci siamo sposati il 17 giugno 2016 dopo varie ricerche abbiamo scelto la professionalià e la bravura di Salvatore e la sua band, abbiamo pianificato insieme il tipo di musica eravamo orientati su musica anni 50 rock e irlandese per il ricevimento mentre per la cerimonia ci hanno accontentato con musica soft tipica orientale visto che il nostro matrimonio era con rito buddhista, siamo stati molto contenti del risultato gli ospiti anche hanno ballato e ci siamo divertiti fino a tardi. consiglio questo gruppo per la loro bravura professionalità e flessibilità. Ciao Elisa, grazie per la tua recensione, è stato veramente un piacere per noi a suonare al tuo matrimonio, c'era una bella atmosfera, e anche noi ci siamo trovati molto bene. 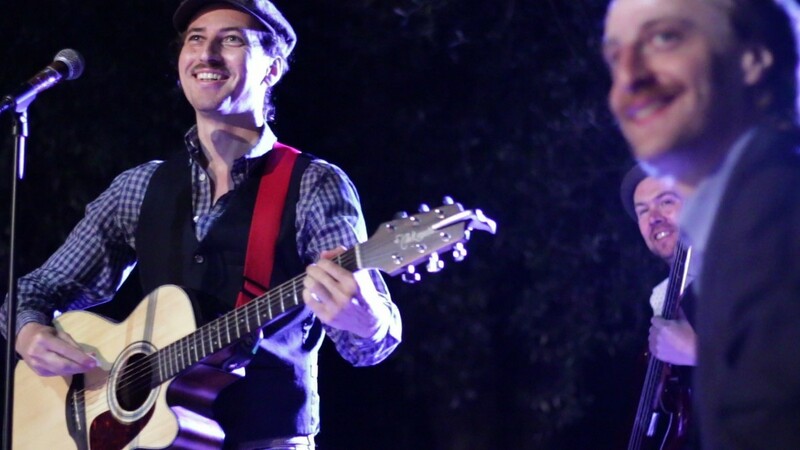 Tanti saluti, Sal dei The Waistcoats"
Thank you for playing at our wedding. Everybody was very amazed at guitar playing duo.They couldn't believe how much you played non-stop and your stamina was remarkable. We all enjoyed thoroughly.